A lightweight alternative to canvas, ready to hang framed poster features your image on high-quality matte poster stock. 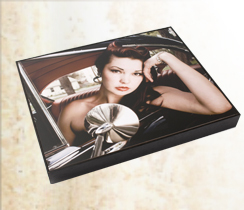 Printed image is mounted onto a masonite board approximately 3/8" thick and set into a sleek wooden box frame. Frame colors are black, chocolate and ash.